At the confluence of the Potomac and Cacapon Rivers, is the small town with the big name of Great Cacapon. 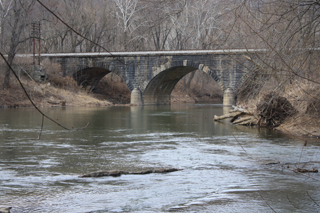 The confluence of the streams is one of the most scenic spots in the entire Potomac Valley. National Geographic magazine once picked the view from West Virginia Route 9 high above the Potomac as "one of the 10 most scenic spots in America." A West Virginia highway marker proudly marks the spot, called Prospect Peak. The Potomac descends from the mountains, making a stupendous turn at Cacapon Mountain to flow northward for a few miles.